This guest house is located at the back of the courtyard of www.vrbo.com/371457. It is a one bedroom, one bath house. The bedroom and bathroom are located upstairs. Downstairs is the living room and the kitchen. The futon couch has an 8" memory foam full-size mattress. It shares a gorgeous, classic New Orleans courtyard with the front house. There is gas grill and a fountain in the courtyard. There is a bistro set just out side the door, as well as four-seat outdoor table and chairs available for outdoor dining. And a balcony with seating to look out over the courtyard. Please note: the walkway back to the house is narrow - room enough to roll luggage down it, but still narrow. We provide linens, soaps, coffee, etc. 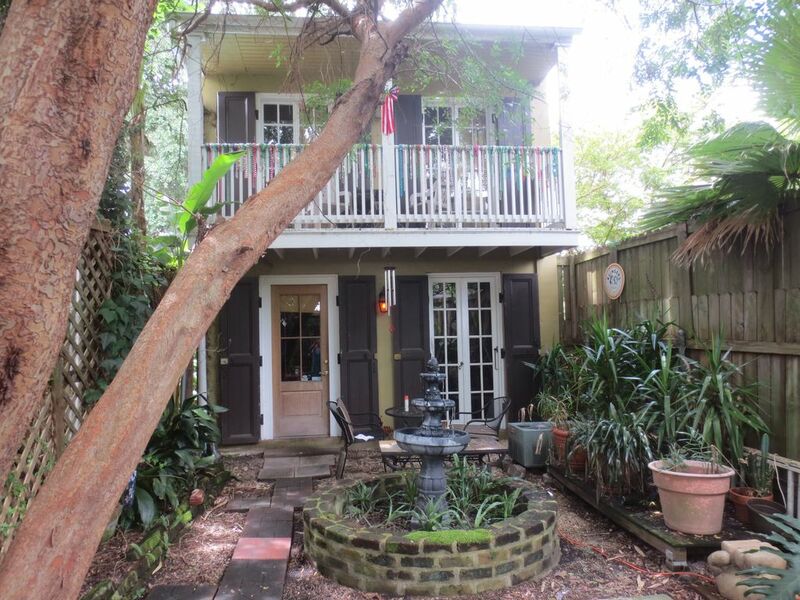 I bought this property in order to spend more time in New Orleans. I love this town! My stress level immediately lowers as soon as I can pick up WWOZ on the radio on the drive down from Indiana. I got super lucky when I found Ginger Miller, the property manager. Ginger has worked as front desk clerk in a boutique hotel in the Marigny, so she is a great resource about the neighborhood. She lived in this house for our first four years and she still handles all your needs for the houses. As soon as I walked in the house, I knew it would have to be mine! I loved the courtyard most! When you are in the courtyard, it is easy to forget that you are so close to all of the hustle and bustle of New Orleans! The bathroom has a small claw foot tub with a shower adapted for it. The refrigerator is smaller than a full-size fridge (but bigger than a dorm fridge!). The kitchen has a toaster, coffee maker, and microwave. Living room TV is a TV/DVD player. There is a long narrow alley that is used to access this house. The house is cozy with a location close to many things - but while you are there you will find it to secluded and tranquil. It is well-lit and felt safe as well. Ginger (manager) and Anne (owner) were both on top of everything and replied quickly to any inquiries. Ginger made the house so welcoming upon our arrival and there is just about everything you can think of available from coffee to baggies to toiletries, extra blankets, etc. The location is fantastic to both Frenchman and the French Quarter. We love Nola and for us renting this home was better than staying in a hotel. We are already recommending this place to family and friends. Location couldn’t have been better, a quick walk around the block to the middle of the action on Frenchman, and a nice stroll to the French Quarter. Shockingly quiet considering! House had charm to spare. Note that the lovely courtyard in front is shared with the front house, so it could potentially get loud if they’re in the garden. Hope to return! Funky comfortable quiet upbeat tiny house. Would stay again! We stayed at the Hideaway house for 5 days. Quiet spot and peaceful. House felt like a New Orleans home and had everything we needed. ginger was very helpful and quickly available by phone. Able to walk to most areas. Only took an Uber to the garden district. Would definitely return if we go back to NLO. This little place is secluded with a private little courtyard perfect for having your morning coffee. It is two blocks from everything you could want to do. We parked our car and walked the entire weekend. Even though the house is so close to everything, you would never know it. Even sitting on the upstairs balcony you do not hear the hussle and bustle of Frenchman Street. We are already looking at a return trip! Thanks so much for taking time to post a review! We love it when guests like the house as much as we do! The Marigny (mare-i-nee) neighborhood is adjacent to the French Quarter. It is an eclectic area filled with artists. I first fell in love with it in 2009 when we came for Jazz Fest. I travel with my dog and walked the neighborhood every day. I bought this property on my second visit to the city in 2011! There are coffee shops all over the Marigny and Frenchmen Street is packed with live music clubs and an art market in the evenings. What more could I ask for? The Pet Fee is $15/night per pet. Rates are subject to change until confirmed.